Remember when you were little, and you went to camp or a friend’s house during the summer, and the pony beads got pulled out? I remember trying to work my way through a keychain animal project and not being too terribly thrilled at the final outcome. However, those experiences gave me a love for beading and jewelry-making in general, and upon discovering the wider world of beads and updated techniques for projects, I’m eager to begin again with something that’s a little less simple, but still just as cute as those beaded animal projects. 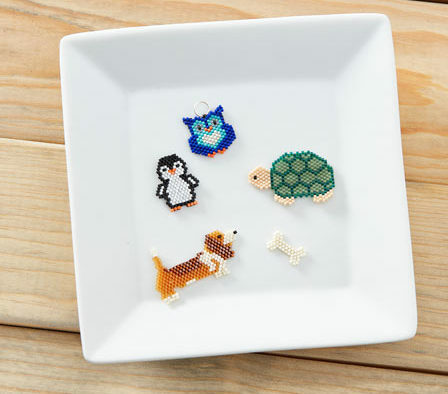 That’s where these beaded pets from Interweave come in – they’re made with smaller beads, which means they look less elementary and are able to be more personalized than the original Pony bead projects. Using various types of beads can glamorize, edge up, or soften the animals and make them unique to each individual who makes them – or who will be receiving them. Interweave’s Madeline Orth recounted her story of trying to find the perfect handmade present and discovering a wealth of beading patterns on Pinterest. Some of these, including the penguin she made, are available for free. You might also want to consider purchasing an issue or two of the Beadwork magazine, or borrowing a few copies from your local library (if they do not carry Beadwork or a similar jewelry magazine, you can request that they do so and they will alert you when the issues are available). Other avenues for patterns to consider are beading books in hardback or online (Interweave suggests using Karen Parker’s e-book “Brick-Stitching Nature: Charts for Beaded Butterflies, Dragonflies, and a Honeybee”). They can be borrowed from your library’s online portal, through their regular lending services, or purchased through sites such as Amazon. Whichever route you choose, free or for-purchase, book, website, blog, or PDF, there are thousands of animal beading projects waiting to be made into keychains, jewelry, Christmas ornaments, wine glass charms, purse and phone accessories, and more. You’ll want to start with something simple, with few colors. Adding in patterns, colors, and a variety of beads will make the project more complicated and take a longer time, which will add to the frustration of learning the ladder and brick stitches, so go easy on yourself and choose something with two or three colors that has a simple shape, such as an owl, a turtle, or a bee. 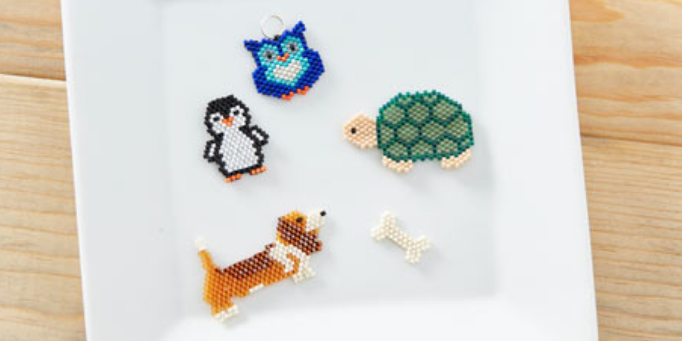 After you get the hang of making bead animals, you might want to branch out and explore other options, such as Interweave’s “What’s Your Sign?” project, which takes your astrological sign and puts it into a simple design which you can use as a dog tag to mark your luggage, keys, gym bag, purse, or phone. You can find the original Bead Animals post and the Astrological Sign post on Interweave. If you’re interested in purchasing the Brick-Stitching Nature book, you can access the link via the Interweave website as well.